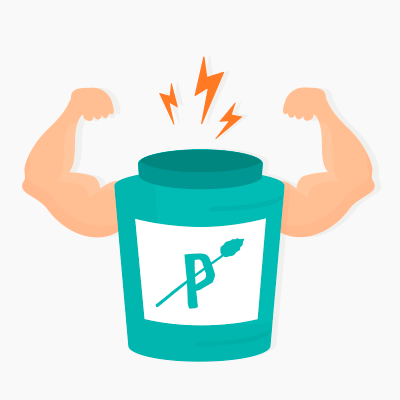 Creatine and BCAAs: Are they Paleo? Do they Work? But what about two other kinda-sorta protein supplements, creatine and BCAAs (Branched-Chain Amino Acids)? The claim for both of them is that they help improve muscle growth and let you recover faster from one workout so you can jump right into the next. So is it true? And are they Paleo in the first place? Here’s a look at the research. 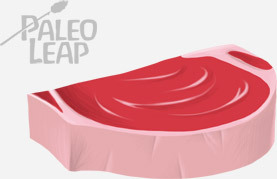 Red meat: Nature’s creatine powder. Creatine is a “natural” compound in the sense that you can get it from eating red meat. In fact, even if you’re a vegetarian, you can still synthesize some of your own from other amino acids. But your body is capable of storing more creatine than you could reasonably synthesize yourself or get from food (unless you want to eat several pounds of steak per day), and a lot of research has indicated benefits for topping up those stores with supplemental creatine. This supplemental creatine, for whatever it’s worth, is synthetic – supplement makers aren’t extracting it from beef and lamb; they’re manufacturing it in a lab. It’s identical in every way to the “natural” stuff (“natural” is not a synonym for “good”!) but it isn’t actually purified extract of steak or anything. That’s what creatine is; now what does it actually do? Creatine is most famous for increasing your capacity to do high-intensity work – it provides ATP energy to your cells, which gives you just a little bit of extra oomph when you’re trying to do something like a sprint or a very heavy lift that taxes your body’s ability to produce enough energy. This position statement from the JISSN gives a very readable overview of the benefits. Several studies have shown that creatine is effective for improving exercise performance in several different sports. It also helps you gain muscle – not because the creatine itself creates the muscle out of nowhere, but because it lets you train harder and recover faster. It also has some interesting fringe benefits. For example, it may be helpful for age-related diseases and depression. In general, creatine is safe as long as you’re reasonably smart about taking it and remember to stay well-hydrated. Some people are allergic to it; those people should obviously avoid it. Some people have uncomfortable side effects like cramps, especially when they first start taking it, but no studies have shown serious or dangerous side effects. On the other hand, some people simply don’t respond to creatine at all, either because of the kind of muscle fibers they have, or because their existing creatine stores are high enough already. If you’re eating Paleo, you’re getting plenty of creatine for your baseline needs, and probably plenty to support a moderate amount of strength training and muscle mass. But past a certain level, muscle gain is unnatural, and if you’re going for that as a goal, then extra creatine is one of the safest “unnatural” methods for getting you there. It might be very helpful for people trying to gain mass on a pescetarian or vegetarian style of Paleo. There are many different forms of creatine. Creatine monohydrate is the best-studied and its effectiveness is the most proven. Watch out for added junk! This is one of the major problems with protein powders; don’t repeat it here. Taking creatine with a meal containing carbs will increase the creatine retention in your muscles. Typical supplementation protocols call for a few days of “loading” where you take a high dose and then a follow-up maintenance phase where you take 3-5 grams per day. Protect yourself. Creatine is regulated as a supplement, meaning that it’s effectively not regulated at all. Here’s a guide to choosing supplements wisely – it’s worth paying for an actually high-quality product. Next up: BCAAs. BCAA stands for Branched-Chain Amino Acids. Amino acids are the building blocks of protein: the point of BCAAs is that instead of eating the protein and then having to break it down yourself, you can just skip straight to the broken-down form. BCAAs don’t provide all the amino acids found in a complete protein; they only have three (leucine, isoleucine, and valine). The rationale for this is that various studies have shown anabolic benefits for these three in particular. There’s some evidence that BCAAs provide a minor fatigue-reducing benefit when taken during a workout, and supplements are just more convenient for that – you probably wouldn’t want to stop in the middle of a run for some scrambled eggs, but you could easily toss back a few pills. They may also be helpful for immune recovery (exercise can be hard on the immune system). On the other hand, there’s not a lot of evidence that BCAAs actually improve performance. If you’re eating enough protein from food, you’re already eating an adequate amount of leucine, isoleucine, and valine without even having to try. There’s no reason why a healthy person shouldn’t be able to break down the protein in food to get them. With that in mind, there doesn’t seem to be much of a reason for most people to take BCAAs – unless they’re fasting. BCAAs are often used to prevent muscle breakdown during a fast. For example, they’re recommended as part of the LeanGains protocol during the fasting period. For this particular application, BCAAs might be more useful, but for recreational athletes who aren’t fasting, they’re likely overkill. You can buy them either as pills or as a powder. Pills are convenient for carrying around, but you do have to take a handful, and they end up being more expensive. Protect yourself. BCAAs are regulated as supplements, meaning that they’re effectively not regulated at all. Here’s a guide to choosing supplements wisely – it’s worth paying for an actually high-quality product. Creatine and BCAAs are two very popular supplements for strength and endurance sports. They’re not necessary for anyone, but for athletes who like to push themselves, they can be useful, and from a Paleo perspective, neither is likely to be dangerous. What they won’t do is substitute for a proper diet, an intelligent training routine, a regular sleep schedule, and/or effective stress management techniques. Creatine isn’t magic. If you have all those other things down, then a supplement might be something to consider, but no amount of supplemental stuff will ever replace the basics.